Flotsam is a book that intrigued me from the first line of its cover blurb. 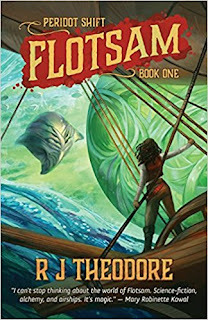 A fantastical steampunk first contact novel that ties together high magic, high technology, and bold characters to craft a story you won’t soon forget. Seriously, that one line promises a lot. The further I read, the more excited I became, until I started to worry my expectations were becoming too high. No matter how good a read it might be, R.J. Theodore had her work cut out for her - through no fault of her own - in delivering on those expectations. Having had a few days to digest the book, to separate the emotions from the thoughts, I am pleasantly surprised to say it was everything I wanted - and perhaps even a bit more. 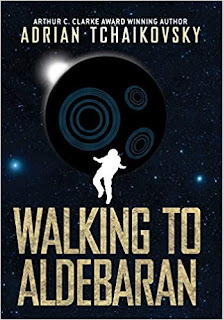 This is a book that starts out with a crazy treasure hunt that is of neither the deep-sea nor the outer-space variety, but somewhere in between. We're introduced to Captain Talis as she's dangling in the air, waiting to explore a shipwreck within the detritus strewn layer of the atmosphere. It has all the elements of a pulp adventure to it, complete with betrayal, attack, and pursuit, and kicks things up a notch with the appearance of a freakin' spaceship. Yeah, you heard me, a beautifully odd ship of silver, floating alongside sail-driven steampunk airships. There is a lot to like here, beyond the rather cool concept. The characters are a lot of fun, some more developed that others, but all of them more than just stock figures. The world building is impressive, and even if it feels like there is a lot that's been held back at this point, what we do get is satisfying enough to turn questions into anticipation. 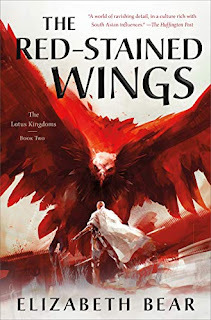 The action is fantastic, something of a cross between space opera and nautical warfare, and the hand-to-hand combat is refreshingly unorthodox. Theodore does a great job of playing to the genre conventions, but never settles for being predicable, even if it means forcing the reader outside their comfort zone sometimes. As an added bonus, the aliens are truly that - alien - humanoid in appearance, but visibly crossed with other species, and having a class-based system that surpasses any question of gender. 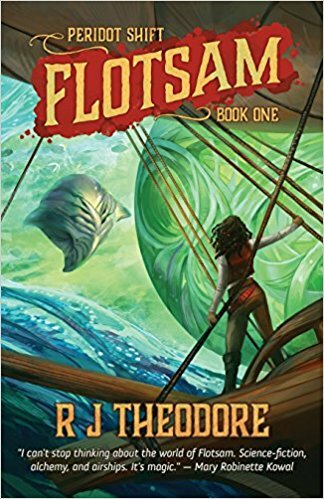 While Flotsam does explore some themes of gender, class, and authority that are interesting, it is most successful as fantasy escapism. This is fun, fast-paced, and, and clever enough to keep you guessing. 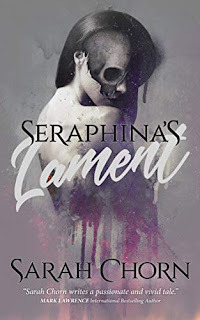 As a standalone novel it does, perhaps, leave too much unknown or open-ended - especially with its cliffhanger ending - but as the opening to a series it is everything it needs to be to keep us reading.